It’s a thrill to be involved in an opera project and tremendously exciting to be able to show glimpses of the work as we go. (And it’s also tremendously helpful to hear the work as it’s being written, so that we can make sure that all of it flows organically.) 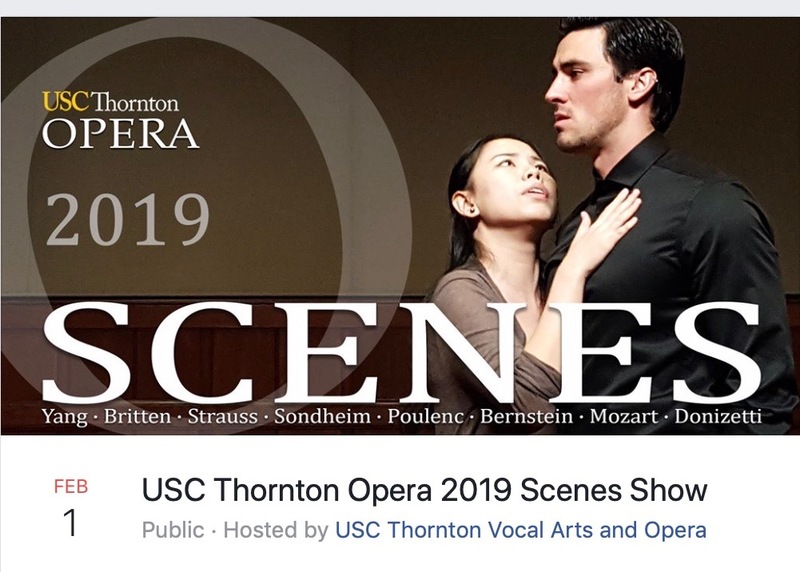 But what’s even more fun is to look at the marketing for the opera scenes concert and see my composer’s last name, Yang, listed with the names of other composing giants: Mozart, Bernstein, Donizetti, Poulenc, Sondheim, Britten! We’re delighted to share a scene from THE NIGHT FLIGHT OF MINERVA’S OWL, libretto by Paula Cizmar, music by Guang Yang, February 1, 2019 at the Alfred Newman Recital Hall, 3615 Trousdale Parkway, Los Angeles. Brent McMunn, conductor. Ken Cazan, stage director. Presenting various opera scenes, including an excerpt from The Night Flight of Minerva’s Owl.